Any game recommendations are always welcome. Seeing as I'm soon going to go back to the Alien franchise at some point in the near future, I figured I'd go with the most acclaimed game in the series: Alien Isolation. This game was released in 2014 and came across as an apology for the horrifically bad Aliens: Colonial Marines that came out the year before (I'm sure I'll come across that dumpster fire at some point in the future). Before I get started, I should say that I have completed the game on both Xbox One and PS4, and I would definitely recommend the PS4 version over the Xbox version if you have the choice as I found that the Xbox version had some framerate issues and occasional glitches whereas I never noticed any issues on PS4. And these are just the standard consoles I have so make of that what you will. 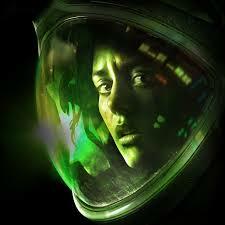 The story takes place 15 years after the events of the first movie (this game assumes that the other movies never happened) as we play as Nostromo survivor Ellen Ripley's daughter Amanda. Amanda has been informed that the flight recorder from the Nostromo has been recovered on the space station known as Sevastopol, and in the hopes of finding out what happened to her long lost mother, she heads out with the Weyland-Yutani company to find out what's on the recorder. Once you reach the station, something seems wrong as communications are down and there's debris all around. After crash landing with a Synthetic called Samuels and lawyer from the company, you find that the station has turned into hell. There's dead bodies all over the place, the station is falling apart, human survivors are willing to kill anything they see move, the Synthetics have turned against the humans and will hunt you mercilessly. If all that wasn't enough, there's also an Alien creature on board that cannot be stopped. This whole game is like a love letter is like an homage to the original 1979 movie as everything from the environment to the sounds of the ship to the soundtrack sounds like it's pulled straight from it and as a huge fan of that film, I absolutely loved it. We've had so many games that just try to be shooters and make the Aliens out to be jokes, but this is the first proper time we've seen the Alien as an unstoppable threat. The only defence you have against it is a flame thrower you find later on and even then the ammo for it is scarce and only fends off the Alien for a short enough time for you to move on or hide. I almost guarantee that the first time you will be killed by the Alien you will need to turn the game off to recover from the shock. My first death came when I was hiding in a locker. It was silent and I thought it was safe to come out, at which point the Alien decided it would be a fun idea to tear off the door and eat my face. I needed a change of underpants after that one. 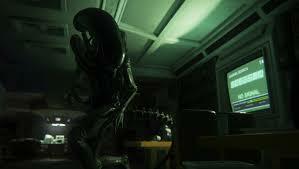 The Alien is just a AI marvel as after a couple of playthroughs I can confirm that it doesn't act the same way twice which can make for some of the tensest gameplay you've ever had and it forces you to improvise whether that be from the routes you take to the items you use for distraction. Speaking of the items you eventually end up with a ton to use from weapons like the Revolver and Shotgun (warning using these as ammo is really scarce) from makeshift items like the Molotov and the Pipe Bomb. There's also distraction devices like the Noisemaker and the Flashbang. These can be used in a number of situations with the different enemy types and it does keep the gameplay from going stale. The human enemies aren't too bad and can be dealt with by making noise and setting the Alien on them, although that then means that you need to deal with the Alien so it's probably better just to sneak around and hope for the best. I freaking hate the synthetic enemies though as they have some of the hardest sections in the game, especially at one point when you lose all your weapons. They are quite slow and so you can break the line of sight and hide from them which is your best bet as the Alien doesn't go after them (no idea why) and they are bullet sponges. If you have enough rounds in your stun baton you can use that and then just beat them to death which is the method I used most of the time. 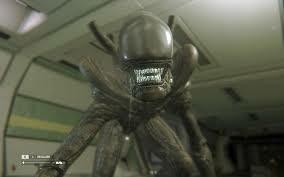 However any combat can summon the Alien so you need to be very careful. One part of the game that usually has a bit of discussion is the save system which some people love and some people hate as there is a quite a large gap between save points and being killed can put back around 30 minutes worth of progression. I'm personally a fan of this system as it makes the threat of death even more terrifying, and the fact that the save systems take a few seconds to load is both evil and genius to really keep that tension ramping up. There some sections towards the end of the game I would like to mention but it would be major spoilers for anyone that hasn't played it yet, but I can say that Alien fans will squeal with joy before screaming in terror. The game is surprisingly long as well which you don't really get with a lot of modern games as the main campaign can take anywhere from 15-20 hours to complete depending on how well you play the game, and this isn't even including looking for all the hidden secrets and ship logs that add more to the story. I only have a couple of issues with the game, starting with the ending. Again no spoilers, but I just found it to be anticlimactic for everything that Amanda has been put through up to that point. There's also a couple of sections that really slow the game down which I'm fine with as it gives you a short break from the more tense sections, but there is a space walk section that just feels like it's there to pad out the game and doesn't really add anything to the atmosphere. Other than that though, this game is an absolute joy for horror fans and Alien fans alike as we get a proper sequel to the original and some of the most heart-pounding gameplay since Amnesia: The Dark Descent. Definitely check it out and please can we get a sequel soon? !